Last Monday, California Attorney General Xavier Becerra announced that his state would be filing suit against the Trump administration, not for conducting a targeted round-up of illegals in the state or even for slapping a coat of paint and some duct tape on a few broken-down sections of border fencing (not that they wouldn’t totally sue for those things), but rather for a simple question the Department of Commerce plans to add a question to the 2020 Census. “Filing suit against @realdonaldtrump's Administration over decision to add #citizenship question on #2020Census. 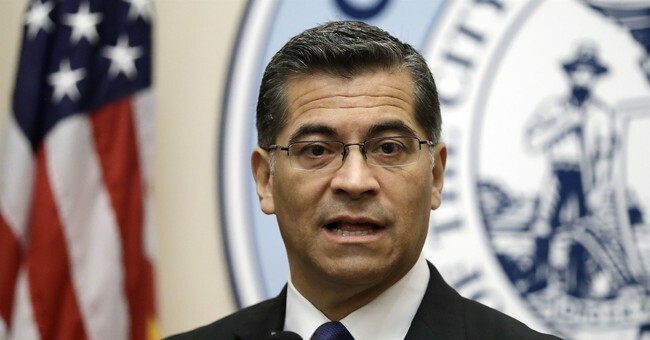 Including the question is not just a bad idea — it is illegal,” read a Monday tweet from Becerra announcing the lawsuit. Nevermind that the Justice Department ASKED census officials to include the question so they could better enforce the Voting Rights Act. And double-nevermind the fact that the Trump administration never stated that they weren’t planning to actually count noncitizens. Problem is, asking about citizenship on the U.S. Census is far from new, much less some sinister Trump conspiracy. In fact, prior to the 1960 census, citizenship questions were regularly included on the form, and even appeared on some long-form questions from 1970 to 2000 because, as University of Wisconsin history professor Margo J. Anderson tells CNN, "We passed major new immigration legislation in 1965, and so the question became relevant again." Which begs the question - when has the issue of immigration and citizenship ever been as “relevant” as it is now? So obviously, there’s more to all the liberal hyperventilating than that. Which brings us to the two major reasons liberals are so up in arms about this simple question, and they’re both, well, sooo liberal - power and public perception. Becerra’s tweet mentioned above also included a link to his San Francisco Chronicle article entitled, “Citizenship question on 2020 census may result in undercount.” In it, Becerra and Alex Padilla argue that class sizes, homeland security funds, transportation resources, and even natural disaster preparation would be “jeopardized,” and California’s “voice in government diminished” should the 2020 census result in an undercount. The fact is, illegal immigrants have always been reluctant to fill out U.S. Census forms, to the estimated tune of at least 40 percent, despite massive outreach programs - including signs in immigrant communities that say “NO INS. NO FBI. NO CIA. NO IRS” - aimed at ensuring immigrant communities that the purpose of the form is simply to gather data. Even so, enough illegal immigrants answer the census for liberals to be rightly concerned about some of their power base. And they’re not wrong to be at least a little worried, which is all the more reason why conservatives should push for this at all costs. While the federal apportionment process is constitutionally determined, there’s nothing to stop states from using citizenship data to determine THEIR legislative districts, as well they should. The second reason liberals are hysterical over the citizenship question is one they aren’t likely to admit (but that doesn’t make it any less true). “Nothing to see here, move on” liberals say, as they insist that the actual number of illegal immigrants has been at around 11 million for well over a decade now, and may even be declining. Illegal immigration isn’t a problem, don’t you know, because there are only 11 million of them and that’s apparently a really small number. Notwithstanding the fact that 11 million is NOT a small number, it IS a number we’ve all gotten used to. But what happens if even a depressed illegal immigrant census count exposes the number as well over 11 million, especially if you account for the depressed response rate? How will a number of, say, 20 million, or, as Ann Coulter surmises, upwards of 40 million, sit with the majority of Americans? At this point, might more be willing to support President Trump on a functional border wall to bring the invasion to a grinding halt? Which is all the more reason to find out.